After a few days, even spring-training enthusiasts may tire of the game-day hot dog and soda ritual. If this applies to you, there are nearby ballpark options beyond the drive-through joints and convenience-store sandwiches. Here are 12 restaurants located within 3 miles of a southeast Valley ballpark to consider for pre- and post-game drinks and eats. Where: 2200 W. Alameda Drive, Tempe. 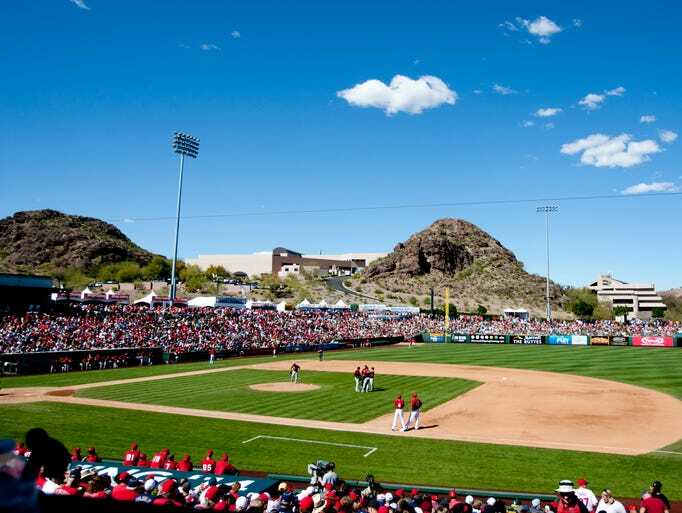 Get up a little early and fill up on the breakfast buffet or grab a casual sit-down lunch in the shadow of the ballpark at the Buttes, a Marriott Resort. Its proximity to the stadium has earned the resort the unofficial designation of Angels nation East. Details: 2000 Westcourt Way, Tempe, 602-431-2367, marriott.com/hotels/travel/phxtm-the-buttes-a-marriott-resort. This hole-in-the-wall offers authentic Coney dogs — the distinct snap with each bite resulting from the all-natural casing is proof — slathered with chili, onions and mustard. Angus beef patties will satiate burger lovers and Better Made Chips and Fagyo Pop offer a taste of home for natives. Details: 930 W. Broadway Road, Tempe. 480-219-7430, detroitconeygrill.com. Skip breakfast and head to this popular barbecue joint that has made a big splash with its Central Texas-style brisket and sausage. Round out your plate with a side of coleslaw or jalapeño Cheddar grits and save room for the Bekke's Secret Pecan Pie. Closing time is 4 p.m., but they tend to sell out before then, so it's best to get there when the doors open at 11 a.m. Details: 4301 E. University Drive, Phoenix. 602-437-1177, littlemissbbq.com. Celebrate a win over a pizza or drown your sorrows of defeat over happy-hour pints at this neighborhood hangout. Choose from dozens of beers on tap and hearty pub-food plates like the Big Freaking Nacho, an intimidating mound of light-fried chips covered with mozzarella, pepperoni and sausage. Or the Moose Drool Burger topped with jalapeño cream cheese and crispy onion rings. Details: 530 W. Broadway Road, Tempe. 480-921-9431, bouldersonbroadway.com. Where: 1235 N. Center St., Mesa. Pick wings or tenders and go sweet and savory with the honey BBQ sauce, lose a dare and take your chances with the scorching ghost pepper-based bath. Or skip the mess and choose from the half-dozen dry rubs. On weekdays, seven dishes are available for $7 each. Details: 318 E. Brown Road, Mesa. 480-464-4383, nativegrillandwings.com. Heed a craving for diverse comfort food at this nostalgic eatery, which features daily specials, breakfast on Sundays and hearty plates that range from carne adovada and chimichangas to spicy chicken pizza and green-chile lobster dip. Wash it all down with one of the specialty margaritas or sipping tequilas. Details: 144 N. Country Club Drive, Mesa. 480-962-1000, originalblueadobe.com. Cubs fans unite here for eats, drinks and general camaraderie — win or lose. For the spring-training season, breakfast is served at 9 a.m. and a free shuttle takes fans to and from Sloan Park. However, its proximity to Hohokam makes Diamond's an easy stop for Oakland A's fans as well; and the happy hour from 1-7 p.m. daily can be enjoyed by all. Details: 161 N. Centennial Way, Mesa. 480-844-3888, diamondssportsgrille.com. Bring the gang to this family-owned pizzeria, which uses an original recipe that dates to the 1930s to craft a flaky crust and tangy sauce as the base for its pies. Lunch-combo specials, pasta and sandwiches are also on the versatile menu. Details: 1925 E. Brown Road, Mesa. 480-834-1541, barrospizza.com. Where: 2330 W. Rio Salado Parkway, Mesa. This is the original location of the Arizona pizza chain that prides itself on Chicago-style pizzas and calzones. The Super Six aims to please a crowd with Italian sausage, pepperoni, ham, red and green bell peppers and mozzarella. Throughout March, guests who bring in a ticket stub from any March spring-training game will receive a free appetizer (one per party). Details: 227 S. Smith Road, Tempe. 480-967-0020, spinatospizzeria.com. You don't have to be a Yankees or Mets fan to appreciate the nearly never-ending options at this New York-style delicatessen, restaurant and bakery. A buy-one-burger, get-one-free special runs March 3-31 (except March 17). That means diners can buy one 1/2-pound premium Angus beef burger and get one of equal or lesser value free with the purchase of two beverages. There are six burger styles to choose from, and burgers can be customized with other toppings at an additional cost. Details: 1160 E. University Drive, Tempe. 480-557-0700, chompies.com. Located minutes away in the Tempe Marketplace, Thirsty Lion has a wrap-around patio that takes advantage of ideal temps and provides people-watching prospects. Grab a quick bite before the game or unwind with a meal and happy-hour drinks, including $4 featured pints, house margaritas, well drinks and select wine. Pair these with menu items such as crab and seafood cakes, pulled pork sliders and grilled pear and prosciutto flatbread, ranging from $3.95-$5.95. Details: 2000 E. Rio Salado Parkway, Tempe. 480-968-2920, thirstyliongastropub.com/tempe. Create a from-scratch treat at this inventive DIY dessert shop. Thanks to a state-of-the-art liquid nitrogen machine, hundreds of ice cream, yogurt and sorbet flavor combinations are possible and frozen while you wait and watch. From March 1-April 1, a buy-one- dessert, get-one-free deal is offered to customers who show a spring-training ticket stub from any game. Ticket stub must be from the current spring-training season and is good for a one-time use. Limit one per customer per visit. Details: 929 N. Dobson Road, Mesa. 480-610-6345, icreamcafe.com.